5.1 Q: Can you tell me how to overwinter begonias? 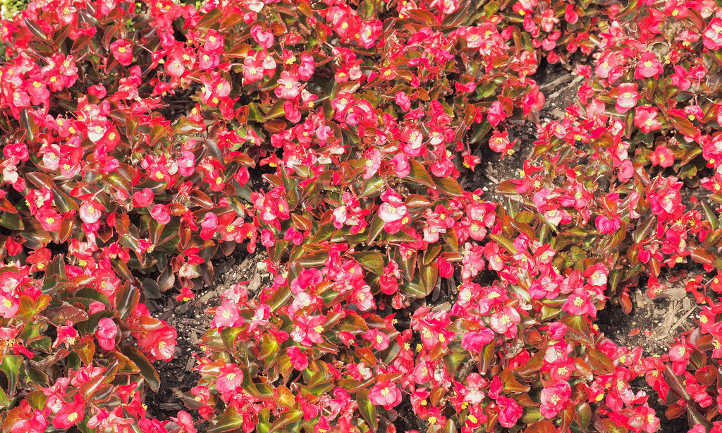 5.2 Q: Are begonias annual or perennial? Begonias are hugely popular plants among gardeners. These plants produce tons of colorful flowers and vivid foliage. Stunning as bedding plants or in hanging baskets, these plants can be easy to care for. Named in 1690 for French botanist Michel Bagon, these plants became formal garden fixtures. 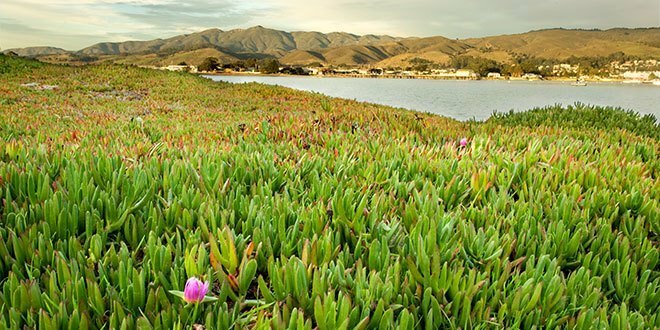 Different species from different regions were discovered, and the plant genus expanded fast. But at the same time, begonias are rather confusing. They can be nearly impossible to categorize. Hybrids abound, and there’s thousands upon thousands of cultivars. Different species like different conditions. It’s a tangled and chaotic genus! Let’s untangle some of the confusion that surrounds these lovely plants. I’ll offer you insight on good general basics for maintaining the health of your begonias. We’ll cover some specifics which are particular to different types as well. Diseases Fungal diseases (pythium stem & root rot, rhizoctonia stem rot, fusarium root rot), botrytis cinerea, powdery mildew, bacterial leaf spotting & blight, and viral diseases (cucumber mosaic virus, tobacco ring spot, tobacco necrosis virus, impatiens necrotic spot, broadbean wilt). 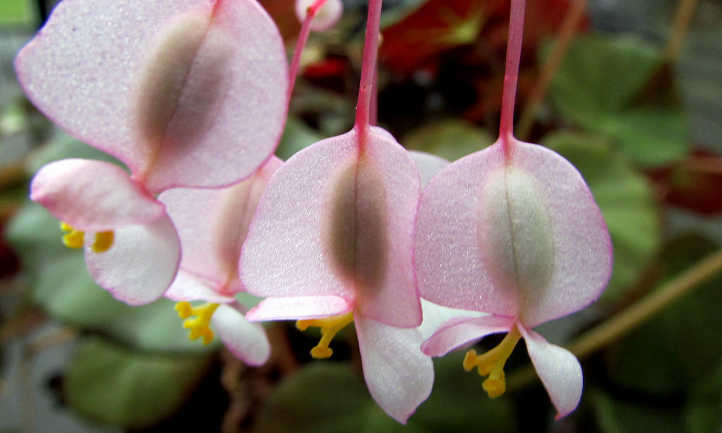 The genus Begonia has at least 1831 species, and possibly as many as 2000! Unlike most other plant genuses, most of these will hybridize with other species. Needless to say, there are thousands of cultivars out there, with more coming all the time. At least eight thousand cultivars are on the market today, and that number just keeps going up. Yet begonias are difficult to categorize. They’re often put into groups by different growing tendencies or root types. But they tend to have lots of crossover between categories. You can easily end up with a plant that shows elements of three or four groupings. Let’s try to break down some of the more popular elements to look for. Remember, these are not hard and fast groupings! These extremely popular begonias are some of the best-known to garden afficianados. Flowers range from white to red with everything in between. The leaves are typically waxy, with fleshy stems. These tend towards uniform growth and can be mounded or bushy in shape. 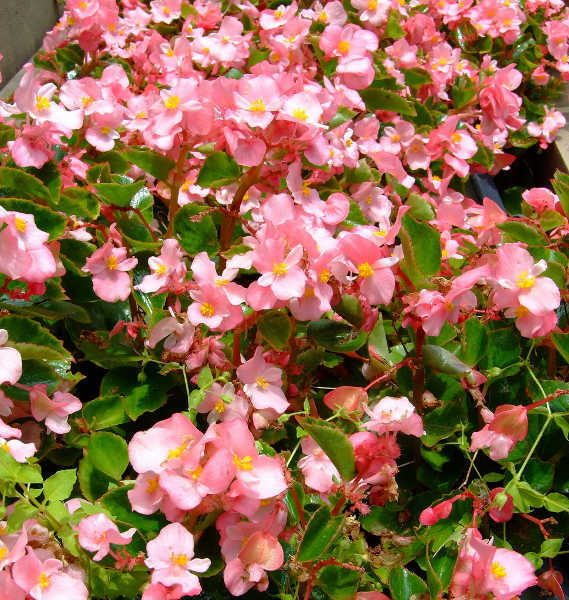 Heat and humidity doesn’t bother wax begonias, and they’re popular as bedding plants. Perhaps you’d like a foliage plant? Rex begonias will deliver. A wide range of leaf colors and patterns are available, with silvery to purple, reddish or green hues. While these do flower, it’s less frequently than other types. Tolerant of lower light conditions, these are great indoors, even with fluorescent lighting. These showy begonias provide a ridiculous number of flowers. Widely found in garden centers in the late winter or early spring, they seem to be awash in color. They love lots of light, but will burn in direct sun. As they’re more sensitive to fungal disease, you’ll want to keep their leaves dry. Usually called tuberous begonias, these have an odd root system. They form large, disc-like flat tubers. One apt description was to compare them to cow manure! Some tuberous varieties are prolific bloomers like Reigers. Others tend to be more sedate at flowering but produce trailing foliage. They’re great in containers. These are spreading begonias, and there’s at least 700 different species. Their root system is close to the soil surface, and they readily root from the stems and leaves as well. Many trailing varieties fall into the rhizomatous group. Woody stems that form bamboo-like joints are a sign of a cane begonia. Sometimes referred to as angel-wing begonias, these varieties can get very tall. Some reach 8-10 feet in height! If you grow cane begonias, be prepared for consistent pruning to keep their growth in check. They’ll produce beautiful foliage and flowers, but they’re definitely fast developing. If you’re looking for a begonia that you can turn into a topiary, this is what you’re looking for. Like wax begonias, they can develop dense foliage, but these can grow to 4-5 feet in height. As their name might indicate, these tend to drape over the sides of containers quite well. Many are rhizomatous, but not all species are. They have many leaf and flower styles, and make perfect overflowing container gardens. 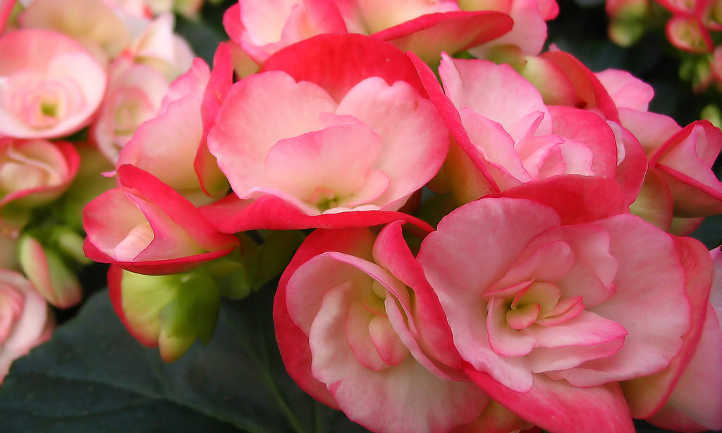 With such a variety of options, people often think that begonias are difficult to care for. Surprisingly, they’re not. They do like specific soil conditions, and they are temperature-sensitive. Provide them the right environment, and they’ll be easy to maintain! Begonias love light, but not direct sunlight. These plants like bright, dappled light or indirect bright lighting. Tucking them on a shaded porch or underneat a tree is perfect. A few varieties like wax begonias can tolerate some direct sun, but partial to full shade is best. 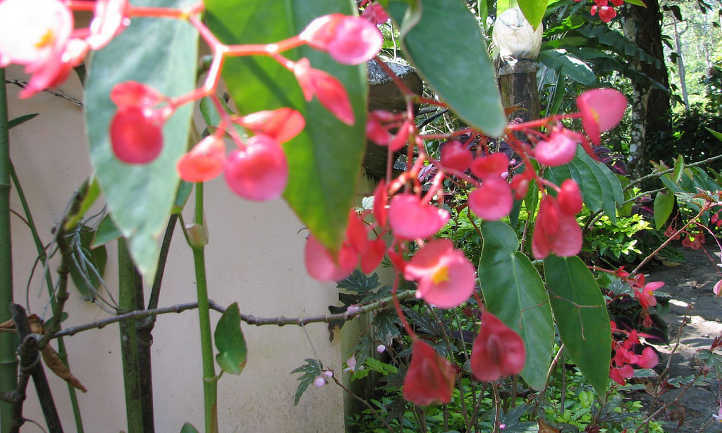 Like many tropicals, begonias have become accustomed to a warmer climate. In zones 9-10, they can be grown as perennials, but in most other areas they’re annual. They do not like the cold at all! Temperatures below 50 degrees can cause damage to the plant, and frost conditions can kill it. Avoid early planting if the temperatures are dipping below 50 degrees. Begonias are one of the plants that’s best put out in the mid to late spring, when temperatures stabilize. An optimal temperature range would be in the 70’s during the daytime hours and the 60’s at night. This brings them into the perfect range for indoor plant enthusiasts. Too much water is a problem for begonias, but these plants thrive in humid environments. There’s a delicate balance that needs to be met to ensure the success of your plant! Checking the soil moisture is your key to success. Poke your finger into the soil. If it’s dry to your first knuckle, it’s time to water your begonias. If it’s moist, wait a bit longer. Since these plants prefer a looser and well-aerated soil, the moisture evaporates fast. You’ll need to be vigilant and regularly check the soil moisture. Mulching is an option, but leave a space of at least an inch between the plant’s base and the mulch. The plant needs room to breathe, and having mulch against the leaves can encourage fungal rot. As these plants are tropical, they do love their humidity, and it can be a challenge to keep the moisture up. Indoor plants grown in containers can be placed on top of a pebble tray with water in it. As the water evaporates, it raises the humidity around the plant. Outdoor plants should get a regular misting with distilled water. 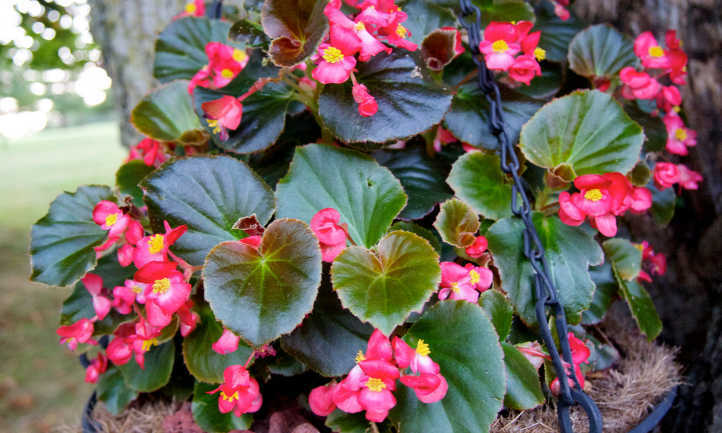 Some varieties of begonias will go into a period of winter dormancy. The plant’s growth will slow or stop, and the plant may lose some of its leaves. If your plant has gone dormant, reduce the watering frequency to prevent fungal rots. Once the plant begins to grow again in the spring, resume your normal watering regimen. Most rich, humusy soil will work for begonias. The soil must drain excess water well while remaining lightly moist. It should also remain well-aerated and loose. A soilless mix is easier to get these qualities with than one which includes topsoil. Unlike many other plants, begonias are acid-lovers. 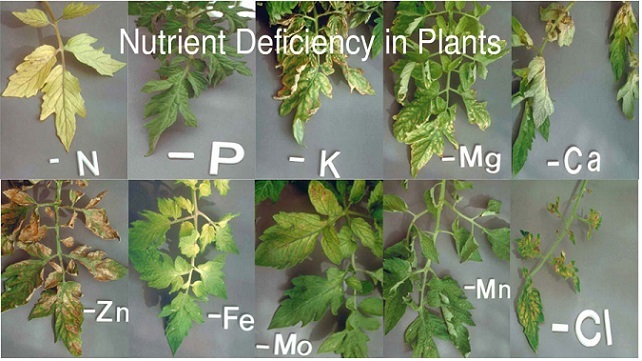 A pH range of 5.5-6.2 is best for these plants. They’ll grow where many plants won’t. In fact, they’ll even tolerate being near black walnut trees. Most other plants will die off near black walnut! 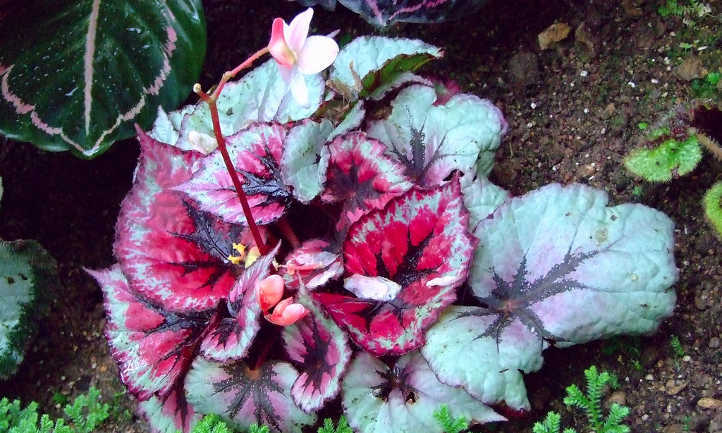 The American Begonia Society has a wide selection of soil blends that they encourage the use of. Some are specialized to a particular region of the country. Others are better for tuberous begonias than other types. Still more are geared towards water retention. Morris’ Mix: 4 parts SuperSoil, 2 parts perlite, 1 part milled peat, 1 part leaf mold. Bob’s Mix: 1/3 last year’s mix, 1/3 oak leaf mold, 1/3 SuperSoil. For people in hotter environments, a good option is Joan’s Mix, which is light and fluffy but holds water well. It is much more complex, but it’s nutrient-packed and makes for a perfect begonia soil. Joan’s Mix: 2 cu. ft. SuperSoil, 2 cu. ft. ground leaf mold, 3 1/2 gallons coarse perlite, 2 gallons coarse vermiculite, 2 gallons small orchid bark, 1 cup hoof & horn meal, 1 cup bone meal, 1/2 cup Superphosphate, 1/2 cup Ironite, 1 cup agricultural lime. Finally, there is a good mix for people who want to stay purely organic or wish to avoid Miracle-Gro products. Paul’s Mix is a blend which is adjustable to suit the water retention needs of your area. Simply adjust the levels of the different components to meet your needs! Paul’s Mix: 3-5 parts sphagnum peat, 2-4 parts perlite, 1-3 parts vermiculite. Begonias are similar to us in that they like a variety of food types. While they’re not super-heavy feeders, they want all kinds of nutrition sources. Trace minerals and micronutrients are as important as the NPK macronutrients. As a general rule, foliar feeding with a diluted liquid fertilizer works best. You should use the right amount of fertilizer for the indicated period, just diluted. As an example, if the package specifies a monthly feeding, use a quarter of the dosage weekly. That way there is continual fertilization for your plants. It’s important to vary your liquid fertilizers as well. Different fertilizer brands will have different trace nutrients your plants require to grow. Changing the types of fertilizer you opt to use will give your plants a good food selection. For most basic feedings, I recommend a 10-10-10 or 15-15-15 diluted liquid fertilizer. Do a foliar spray of this every other week. On weeks between fertilizer feedings, use fish emulsion and seaweed to foliar feed. Dilute these in water as well. Too strong of a fertilizer can cause burning on the leaves. If you’re encouraging blooming, switch to a 15-30-15 about ten weeks prior to flowering. Do weekly feedings with the 15-30-15 to get beautiful, show-quality flowers. 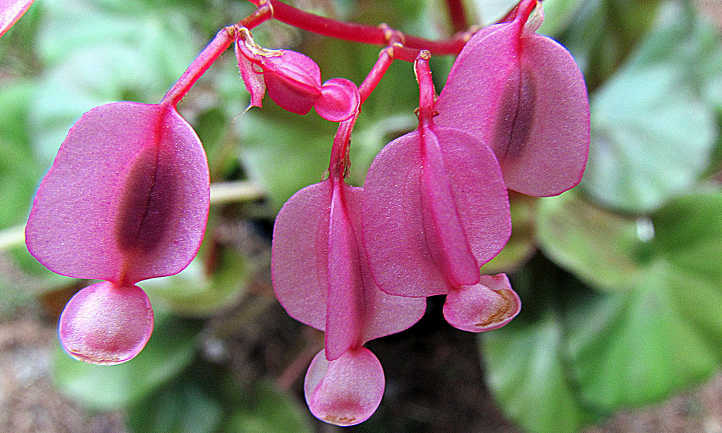 While you can start begonias from seed, it can be complicated. Begonia seedlings need even bright light of the type you get with a high-quality grow light. Uneven lighting will cause lopsided seedlings that will develop poorly. Sterile soil and containers are also necessary. Fungal diseases like damping off are common in begonias. It’s much easier to start begonias from cuttings or tubers. Leaf cuttings are the easiest amongst the cutting types, as even a piece of a leaf can take root. There must be a major leaf vein in the segment you’re planting. Plant the entire leaf if you’re not sure of the vein placement. Stem cuttings and rhizome cuttings are also common. Stem cuttings can be a bit complex, as it depends on the type of plant. Rhizomatous, tuberous, and rex begonias can root from any portion of the stem. All other stem cuttings need to have nodes with buds on them to develop a proper plant after rooting. Rhizome cuttings can only be done on a rhizomatous begonia plant. Two-inch segments of the rhizome are cut and then planted halfway up the rhizome’s sides. These can be prone to root rot when starting, so it’s a bit easier to start from a leaf cutting. Tuberous begonias are a bit different as they develop large tuberous roots. These roots can be dug up in the fall before the weather becomes too cold. Dust the soil off with your hands, don’t wash them! Once the soil is removed, separate the tubers with your hands gently. Be sure there’s an eye or a stem attached to each tuber. Once separated, trim off any stems close to the tuber and coat the tuber with a plant fungicide to protect it. Allow it to cure in a warm, dry location for a few days. Your cured tubers can be stored in a container of dry peat moss in a cool, dry location (45-55 degrees) for the winter. Check them regularly to be sure rot isn’t forming. In the spring when they begin to sprout, plant them. Begonias should only be repotted when they’ve filled up the pot with roots. If you gently remove the plant from its pot and the roots hold onto the potting soil, you’ll know it’s time. But it’s also important not to give your plant too large of a pot. Increasing by one pot size and repotting more often is best. Too large of a pot will hold too much soil, and you run the risk of it becoming too soggy for your plant. A smaller plant should go into a pot no bigger than 1″ larger than its current one. Older plants can go into a pot up to 2″ larger. Also be careful of changing the shape of your pot. Square pots hold more soil than round ones do. If the plant is rootbound, gently loosen the roots with your fingertips. This enables it to take to its new soil easier. Rhizomatous, rex, or tuberous begonias should be planted at the same depth as they were. All other begonias need to be planted slightly deeper than before. 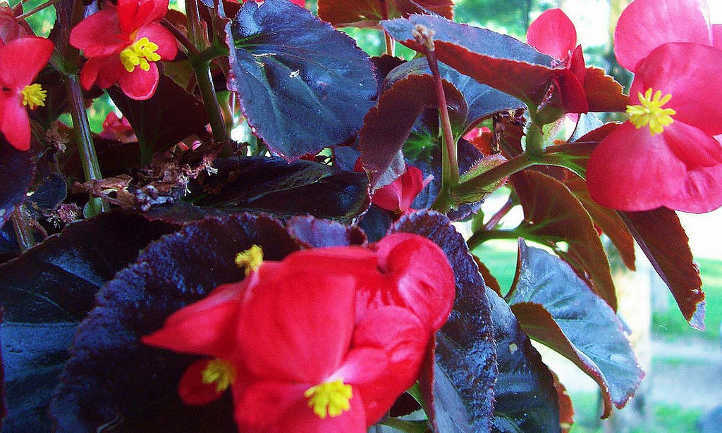 All begonias require some level of pruning, but the extent varies depending on the type. General pruning is performed to encourage more bushiness in the plant. It can also reduce leggy growth, although that may be symptomatic of other issues. To do basic pruning, begin by ensuring your tools are sterile. If you plan on pinching back with your fingers, wash your hands. If you’ll be using good pruning snips, sterilize them with diluted bleach in water. This ensures that no diseases which your hands/tools had come in contact with spread to the begonias. The first pruning should be in early spring, after the new growth has reached 3-6″ in length. Pinch back to just above the first healthy leaf bud from the tip of the stem to cause the plant to bush out. Repeat monthly for the next 2-3 months. As flowers wilt and fade on all begonia species, pinching off the spent flower is always good. Deadheading can encourage another flush of bright flowers. Cane begonias grow to staggering heights, and they often need extra pruning. They can easily grow unmanageable if not maintained. Trim back the tallest stems by 2/3rds of their height in the spring or early summer. 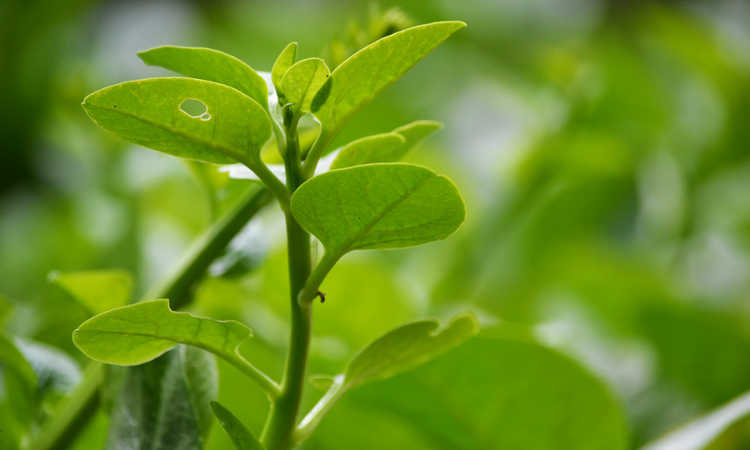 As new leaves and stems will develop at the plant’s base, they’ll get more dense foliage. Finally, tuberous begonias can be trained to grow larger, more appealing flowers. Pinch off excess flower buds that appear at the sides of the stem, leaving only one at the tip of a stem. This redirects the plant’s energy into developing one stunning flower. Otherwise, you’ll have multiple smaller flowers. If they’re cared for perfectly, your begonias should be problem-free. But what issues could arise? Let’s go over pests and diseases that may occur, and discuss other begonia problems. One of the largest issues people experience is leggy growth on their begonias. This is usually caused by lighting issues. Plants that are seeking extra light will stretch towards a light source. Prune off excess leggy growth, and provide better lighting. While full sun isn’t optimal for most begonias, bright light is a necessity. If you’re growing them indoors, you can use an overhead grow light to supplement sunlight. Another lighting-related problem is sunburn. These plants tend to be shade-loving, and too much intense sunlight can scorch leaves. A few species are more tolerant of direct sunlight, but not most. You can slowly acclimate your plants to more sunlight, but they will always need some shade. The hottest times of day are usually when that shade is necessary. It’s best to give them early morning sun if they have to have any direct sun at all. Are your flower buds dropping off? There’s two potential causes. A sudden temperature change from hot to cold conditions can make buds drop. But it’s more likely to be caused by too much or too little water. Be sure to keep your soil evenly moist, but not wet. If you’re using mulch, leave space around the plant so that it doesn’t touch the plant’s base. Don’t allow the soil to completely dry out, but don’t allow water to puddle there either. Another issue is browning leaves. Like bud-drop, it’s usually caused by watering issues, generally too much water. But it can be temperature-related as well. Tuberous begonias also naturally drop their leaves and stems in the late fall. If you don’t have a tuberous begonia and the temperature’s been good, water’s to blame. Reduce the frequency of your watering, but don’t let the soil dry out. Are your flower petals spotting or turning transparent? This is yet another watering issue. Usually, this is a sign of water having soaked into the petals after overhead watering. The best way to prevent this is to use a soaker or drip hose to water at ground level. Sap-sucking pests are an issue for many begonias. Aphids on begonias are not uncommon. Some types of thrips may also appear. Whiteflies can also be common. The juicy leaves tend to be their target! With all these pests, insecticidal soaps are usually the first line of defense. If the insecticidal soaps don’t work on their own, you can move up to a pyrethrin/soap spray combination. Another sucking pest which might appear is a type of scale insect. 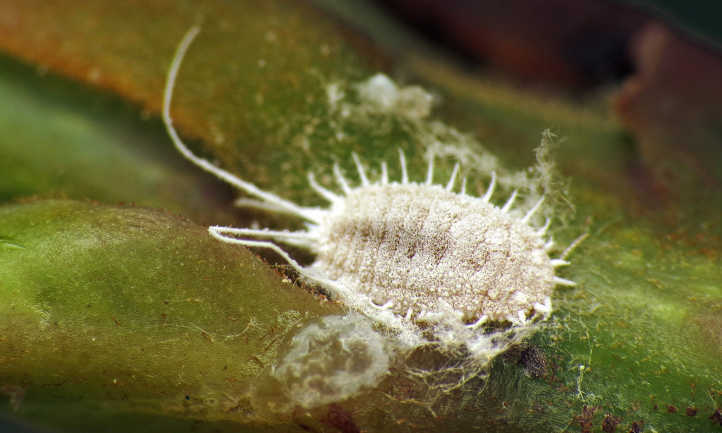 The longtailed mealybug is one of many mealybugs that find begonias to be tasty treats. Mealybugs can be a bit harder to treat. A cotton swab dipped in rubbing alcohol will loosen their death grip on your begonias so you can pick them off. A pyrethrin and insecticidal soap spray will help with these as well. Slugs, snails, and caterpillars will eat begonia leaves as well. With slugs and snails, you can tell they’ve been there by telltail slime trails and nibbled leaf edges. Caterpillars leave much larger leaf damage and no trail. Use a slug and snail bait to lure those pests away from your plants. Most quality baits will poison the snails and slugs so they won’t return. 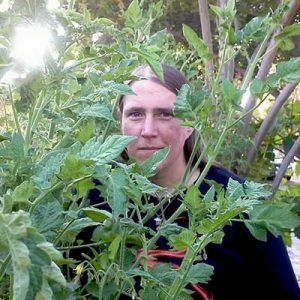 BT sprays will eliminate caterpillars from your plants. A particular type of foliar nematode, Aphelenchoides fragariae, is a rare problem. Unlike most nematodes, this one lives and feeds on the plant’s leaves. It’s microscopic and thus is impossible to see. Plants which have this type of foliar nematode will appear stunted. Some cultivars’ leaves will turn red. Others will develop brown, water-soaked spotting on the leaves. A few will get brown lesions on the stems. Some begonias appear immune. The only treatment for these nematodes is to remove infested plants to avoid its spread. Destroy the infested plants entirely, do not compost them. 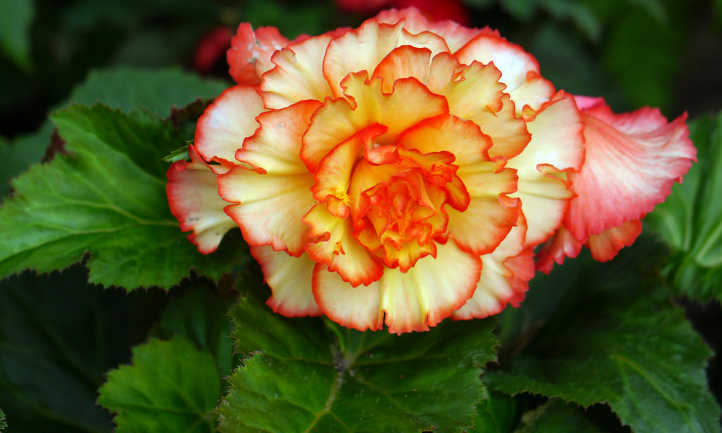 Begonias tend to be sensitive to certain fungal diseases. Different species are more sensitive than others, but there’s many fungi that’re dangerous. Pythium fungi can cause damping off in seedlings. In established older plants, shiny black areas of stem rot will develop on the stems and petioles. These usually appear at or just above the soil line, and usually result in plant death. It can also cause root rot in tuberous begonias. Rhizoctonia fungi acts similarly to pythium. Areas of rot on the stems at the soil line appear, usually just before the plants collapse and die. Occasionally there will be visible fungal growth between the stems and nearby soil. Fusarium fungi cause damping off, just like pythium. They also cause major root rot damage in weaker root systems. This is especially true in tuberous begonias. All three of these fungal diseases should be prevented rather than treated. Once the diseases move into the plant’s tissues, the plant should be removed and destroyed. Prevention includes planting in sterile potting soils. 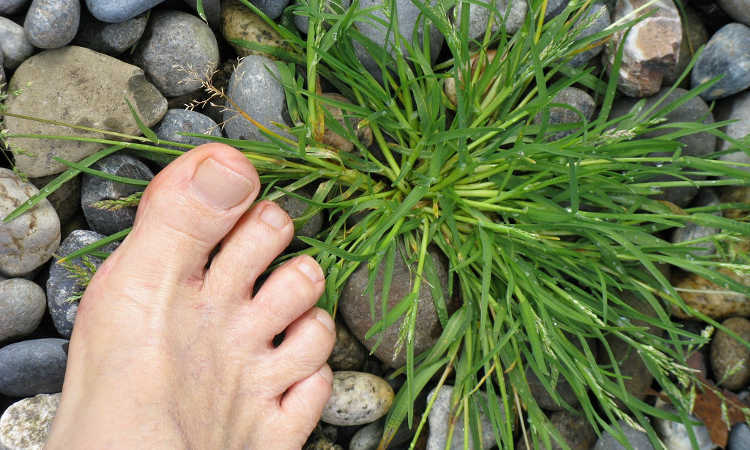 Soilless mixes have less of a chance of developing fungal disease and are best for potting. Mixes heavy in peat moss and perlite allow for good drainage and slow fungal spread. People planting in garden beds should use Mycostop to protect seeds from fungi. 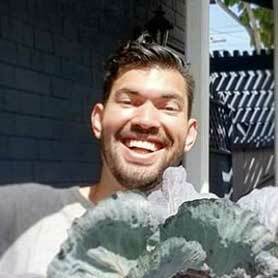 Also pretreat plants that you are transplanting, and do a soil drench in the bed. This will prevent fungal growth in your soil. Another problem is caused by botrytis cinerea. This is also a fungal disease, but it’s a bit more readily treatable. Sometimes called grey mold, it creates dusty grey spores on plants. Damping-off can occur in seedlings, as can stem rot. Botrytis cinerea can be treated with Mycostop as well. Liquid copper fungicides also can stop the spread of this disease. It’s most common in humid and cool environments like greenhouses or indoors. Bacterial leaf spotting and blight is another problem. Xanthomonas campestris pv. begoniae causes water-soaked haloes with yellow edges on leaves. Reiger-type begonias can become systemically infected with this bacteria. In other begonias, it spreads from leaf to leaf, and will kill the leaves off one at a time. To avoid this bacterial leaf spot, remove infected leaves as they appear. Avoid watering from overhead. 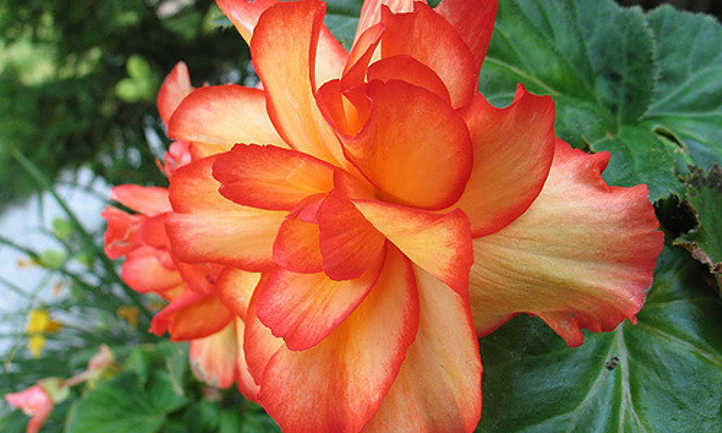 Reiger begonias should be removed and destroyed to prevent bacterial spread. Do not propagate from infected plants. 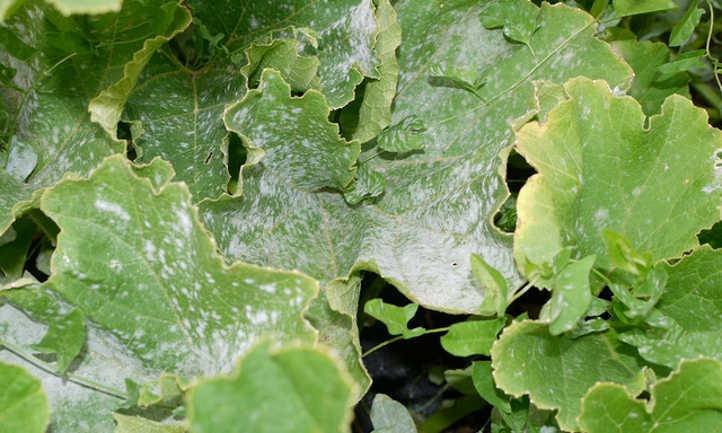 White powdery mildew is a common problem when leaves stay wet for long periods of time. This is thankfully one of the easiest diseases to treat! Spraying neem oil on all leaf surfaces will clear it up quickly. Regular sprayings of neem oil also keep it at bay, and reduce pest populations in your plantings. Finally, there’s multiple viruses which will strike your begonia plant. These include cucumber mosaic virus, tobacco ring spot, tobacco necrosis virus, impatiens necrotic spot, and broadbean wilt. Many are transmitted by aphids and thrips. Infected begonia plants must be destroyed. These virii have no treatment methods currently. Destruction of infected plants reduces the likelihood of further spread. Avoid pests on your plants. Q: Can you tell me how to overwinter begonias? 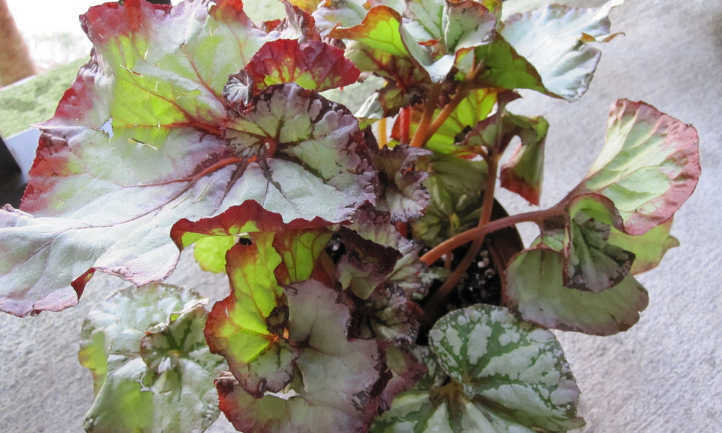 A: Wax begonias and most rhizomatous begonias should be brought indoors to overwinter. They need to maintain a low temperature of about 60 degrees. Ensure they have enough light, using a grow light if necessary. 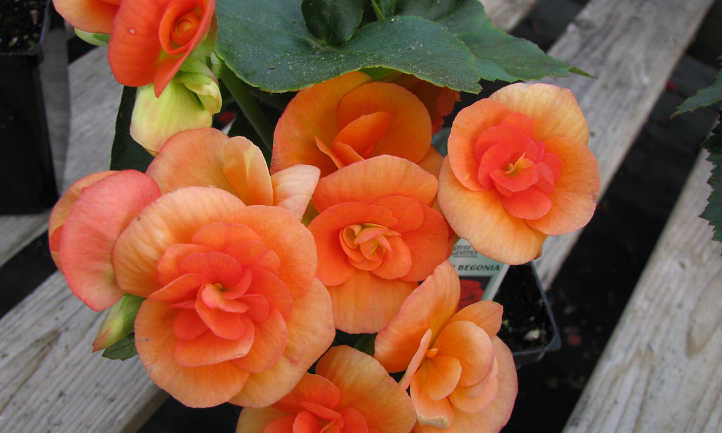 Tuberous begonias can overwinter as a cured tuber packed in peat moss in a dry environment. Read the segment on propagation, which describes how to separate and store tubers. If you live in an environment that seldom gets below 50 degrees in the winter, you can opt to overwinter outside. During cold snaps, you can place a cold frame or plastic sheeting over the plants to maintain warmth. A string of large Christmas lights can add extra warmth around your plants. 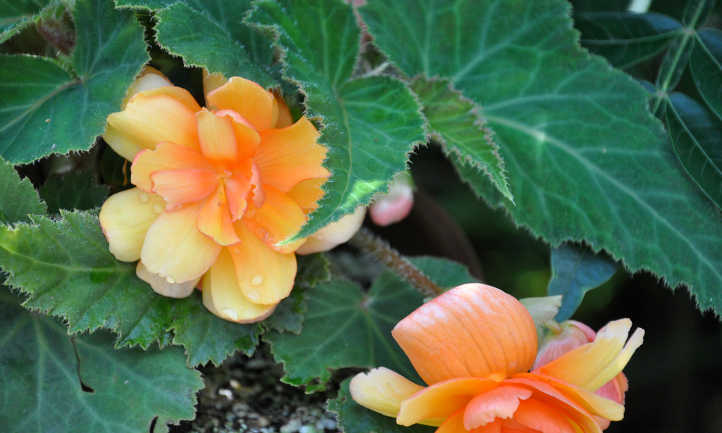 Q: Are begonias annual or perennial? 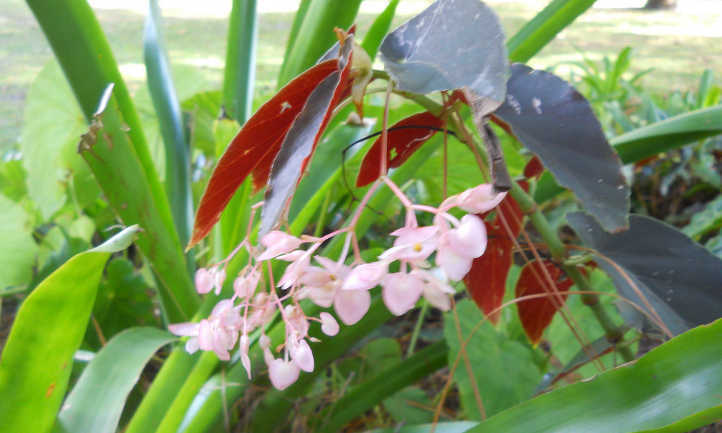 A: While some species of begonia can be grown as a perennial in zones 9-10, most grow them as annuals. Begonias are not frost-tolerant, and temperatures below 50 degrees can damage them. Sure, begonias may seem complex – there’s only thousands of them! But they don’t have to be impossible. You can have a bounty of begonias in your home or garden as long as you give them the proper care. 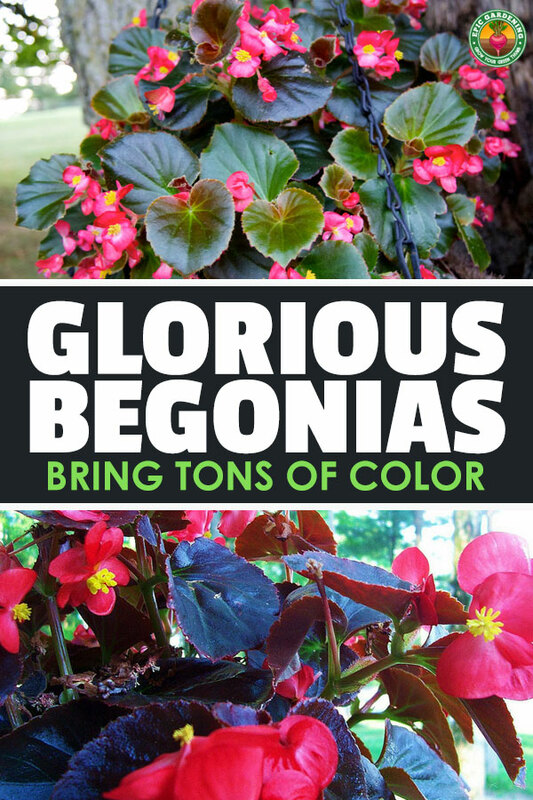 What’s your favorite type of begonia? Let me know in the comments! I love begonias especially because they are easy to take care of! As you said, these plants produce tons of colorful flowers, what is also appreciated by me. For sure it is my favourite type of balcony plants! To be honest, I didn’t know that there are that many species of begonias. I always order mine without looking what type is it, but this time I will focus on it! What I really like is Tuberous Begonia, so according to your tips I will try to grow it from seeds next year!